Resembling a pair of owl eyes, the two nuclei of the colliding galaxies can be seen in the process of merging at the upper left. The blue bridge looks like it connects to a third galaxy. In reality the galaxy is in the background and not connected at all. 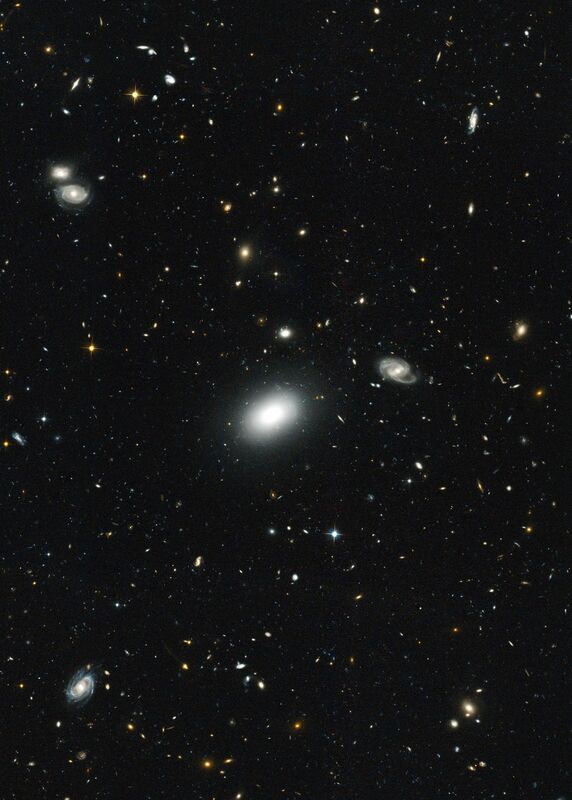 Hubble's sharp view allows astronomers to try and visually sort out what are foreground and background objects when galaxies, superficially, appear to overlap. This picture was issued to celebrate the 19th anniversary of the launch of the Hubble Space Telescope aboard the space shuttle Discovery. During the past 19 years Hubble has made more than 880,000 observations and snapped over 570,000 images of 29,000 celestial objects.